When Manhattan Village invited me to be a part of their first-ever Back-to-School Shopper Challenge, I jumped at the chance. 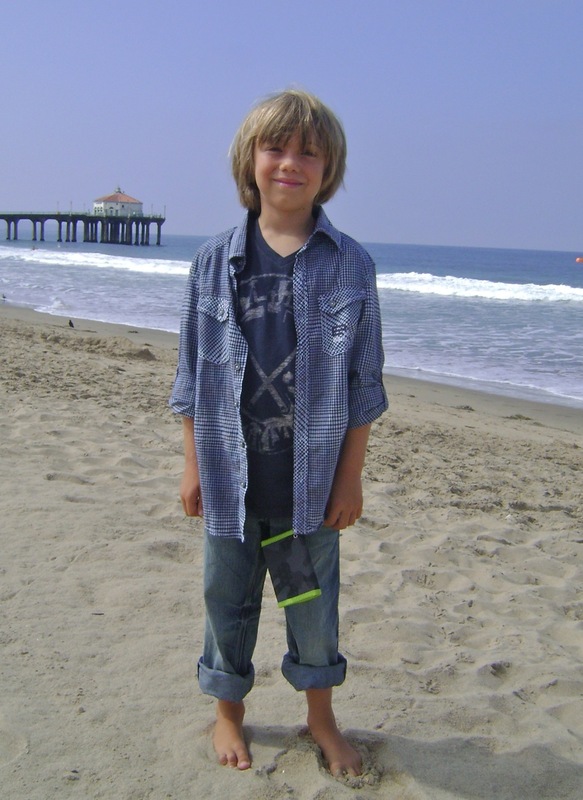 The challenge called for me and two other South Bay bloggers (Manhattan Beach Momma and Thoughts of a Mommy) to find two back-to-school outfits from shops at Manhattan Village for a total of $100 or under. Now our outfits are posted on Facebook, where you can vote on which one you like the best (see the button on the right of the page)! In our family, back-to-school clothes have to meet two main criteria: They have to look good (for Mom) and they have to be super-comfortable (for the boys). The boys also want to be able to express their personalities with clothes that they can wear while doing their favorite activities. Having set those parameters, the boys and I picked out two outfits – and then we headed to our favorite spot at the beach for some pictures. 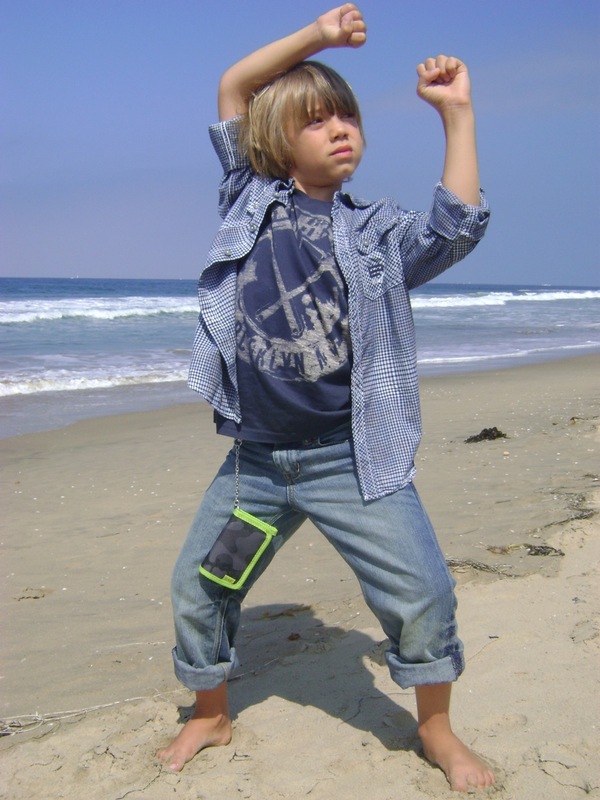 The Karate Kid wants to stay cool and comfortable so that he can practice his moves wherever he goes. 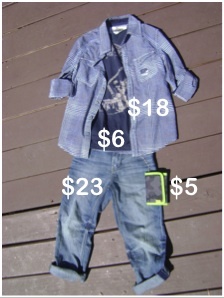 So when we built his outfit we started with these super-cool slouchy cuffed jeans (currently on sale for $23.96) from the Gap. Then we topped it off with these two classic Epic Threads pieces: a t-shirt ($5.99) and button-down ($17.99) from Macy’s. For a fun way to carry library cards and ice cream money, we added this camo/pirate wallet, also from the Gap (currently on sale for $5.97). Note: it comes with a nice little clip and chain to link to your belt loops. The Karate Kid gave the outfit two thumbs up, and even though it was hot out by the time we finished taking the pictures, he never complained and didn’t even take off the long-sleeved shirt. Now that’s saying something. 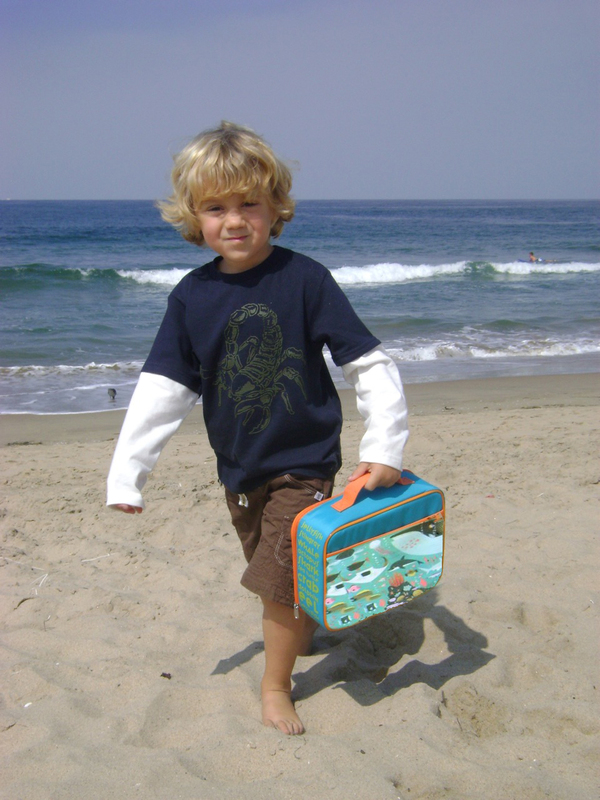 The Explorer has busy days at preschool that can involve anything from writing the alphabet to jumping in a bouncy house, and when he’s not at school, he’s scouring the beach for shells and creatures. He needs clothes that are super-comfortable and sturdy enough to hold up to long days and many washes. 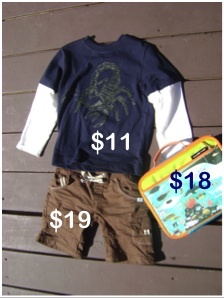 To get him suited up for the school year, we started with this adorable scorpion shirt from Gymboree (currently on sale for $10.99) and these well-made shorts by the German company Kanz and sold at Joli Bebe (currently on sale for $19.60). Then we finished it off with a super-cool (and PVC/phthalate/BPA-free) lunch bag from Crocodile Creek ($18.50), also from Joli Bebe. The Explorer was so comfortable in his new outfit, it was as if he’d owned it forever. 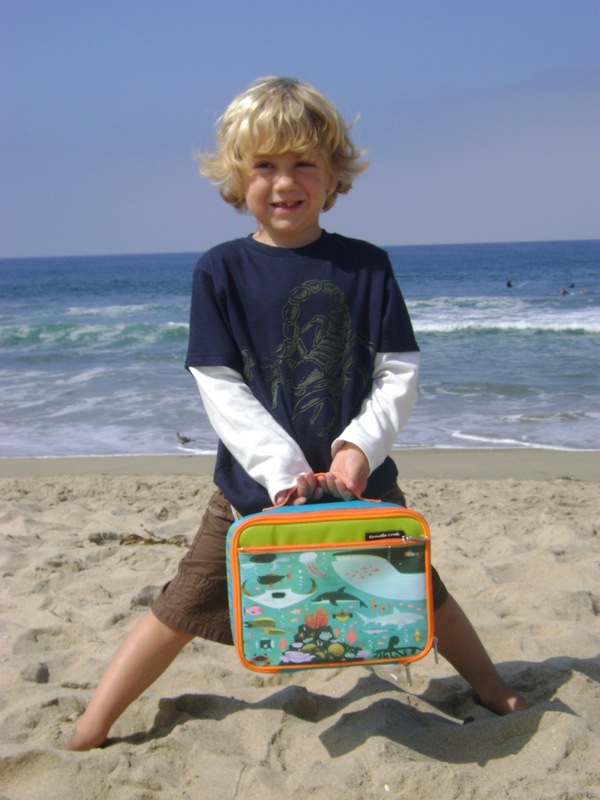 Plus, he didn’t want to put the lunch bag down even after the picture-taking was over. Altogether, it added up to another big score. Throughout the whole shopping experience, Manhattan Village staff and merchants treated us like royalty, honoring us with gifts from Harry and David, Godiva, Williams-Sonoma, Tommy Bahama, Corner Bakery, Lady Foot Locker, Aerosoles, Armani 55, Diane’s Beachwear, Pacific Theaters, Viki Cafe, and Open Sesame. (Fact: We might not have made it through the photo shoot if it hadn’t been for those Godiva chocolates.) 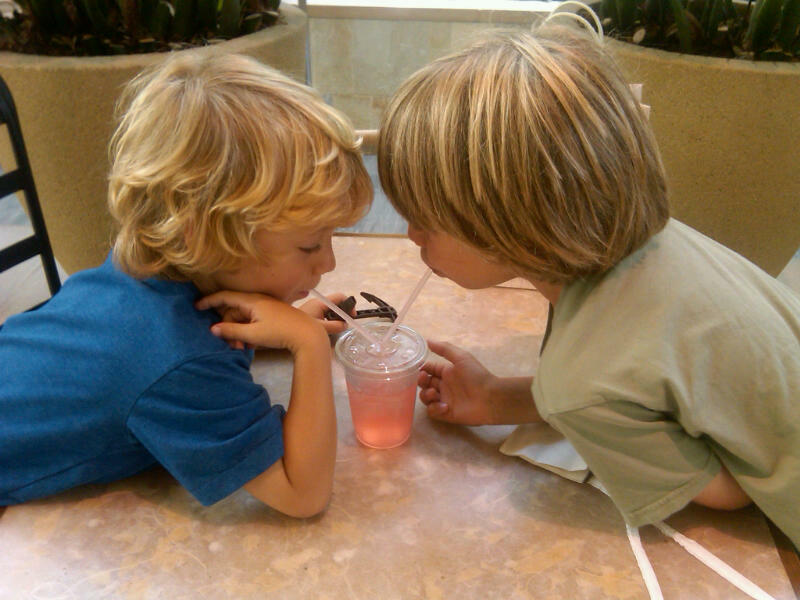 Here are the boys enjoying a post-shopping lemonade just outside Viki Cafe. Many, many thanks to Manhattan Village staff and merchants for the opportunity. We look forward to shopping there again soon! And if you like the outfits we picked, please vote – Thanks! * Disclosure note: I was not compensated for this post. Manhattan Village gave me a $100.00 gift card to shop for the outfits, and also a goodie bag from Manhattan Village merchants.